The notes which follow are those I made at the time, unedited apart from odd comments which with hindsight were a bit too outspoken! Comments in italics have been added after the trip, sometimes many years later - the same applies to the photo captions. Clicking on any of the photos will display a larger version. France (eventually), 18.8.91 - 23.8.91. 1754 Chichester – Brighton, on time and no problems. 1943 Brighton – Newhaven. Late arriving (1944). Away about 1950. Left the train at Newhaven Harbour and walked back up to Newhaven Town. Back at Harbour after a pint, much indecision about toothache. Eventually decided to abandon for the day after checking validity of ticket with Sealink. 2200 Newhaven Harbour – Brighton was 2 late. Advised by conductor to change at Lewes into following Eastbourne – Brighton fast which passes at Lewes. 2250 Brighton – Chichester via Littlehampton. Terminates at Chichester. Various inebriates causing various kinds of offence between Brighton and Hove, and Worthing and Littlehampton. Visited the dentist in Selsey to resolve toothache. 1753 Chichester – Brighton. 9 minutes late but otherwise OK. 1935 Brighton – Newhaven on time. Left at Newhaven Town for refreshment and time wasting purposes. Excellent Adnams at the Royal Standard in Brighton. Not so excellent Harveys at Newhaven. 2230 Newhaven – Dieppe ferry. Left 2255, with ‘hundreds’ of schoolchildren. Arrived about 0410. Booking office open 1030-1430 and 2300-0500 (!) 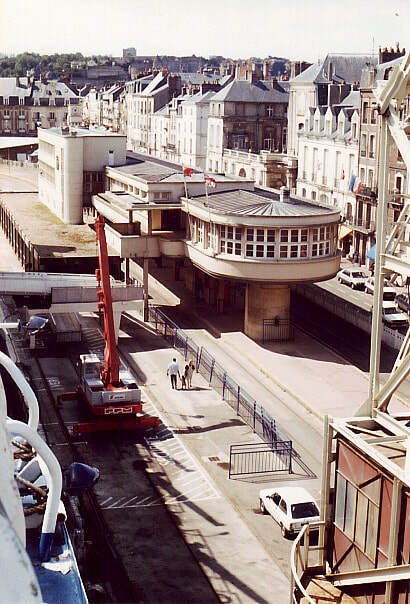 so ticket validated OK. 0447 Dieppe M. – Rouen Rive Droite. Left 1 min late, diesel hauled. Line to main station mostly roadside, Weymouth Quay style. Arr Rouen 0530. New Street-ish – horrible at platform level but very large and impressive concourse. Very efficient loco change to electric. 0553 Rouen RD – Caen. 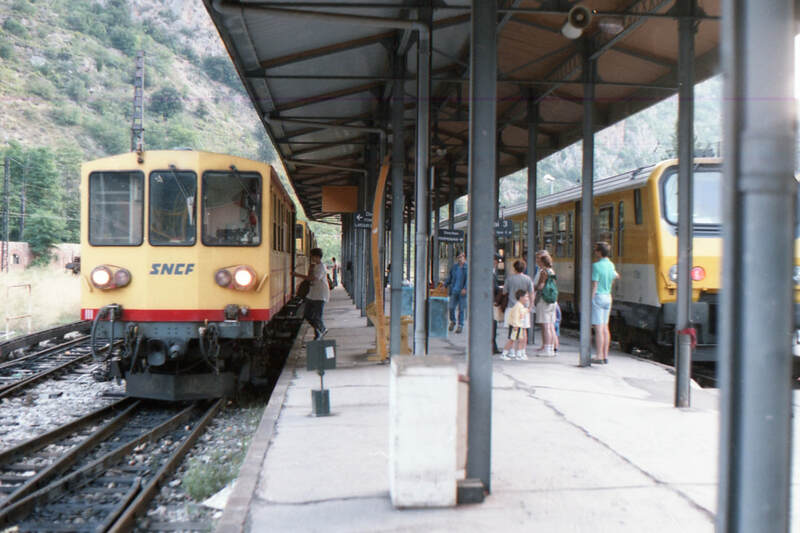 2 car DMU – left on time. 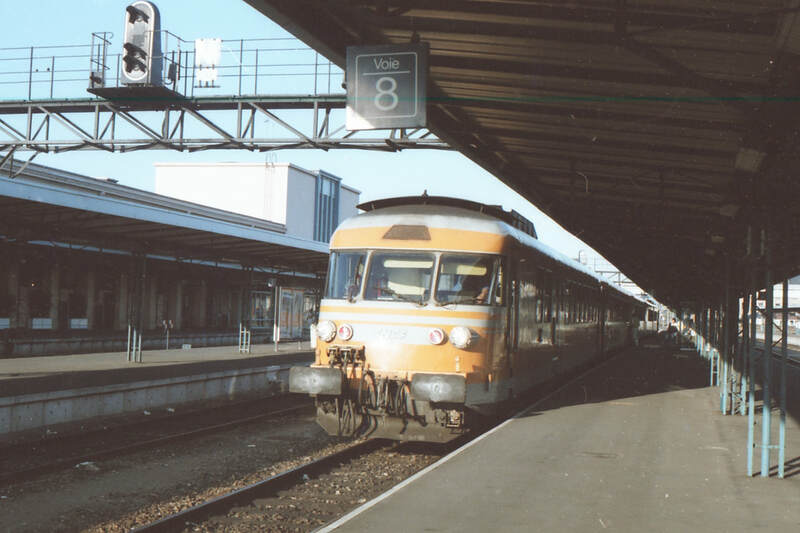 Very extensive yards alongside for some miles after Sotteville, where the DMU was allocated. Impressive bridges over the Seine (presumably). Single line trailed in L. after Bourgtheroulde. ‘Facilities’ amazing on the DMU – cavernous toilet bowl, abrasive paper, filthy towel and lumps in the water (literally). You are exhorted not to drink it. As if… Caen line is like W’ton – Shrewsbury in having stations a few miles apart though some are in very rural settings. Most goods yards have track in them, but no traffic. Ride is comparable to a Sprinter though the set appears older. Yard at Serquigny contained some wagons. 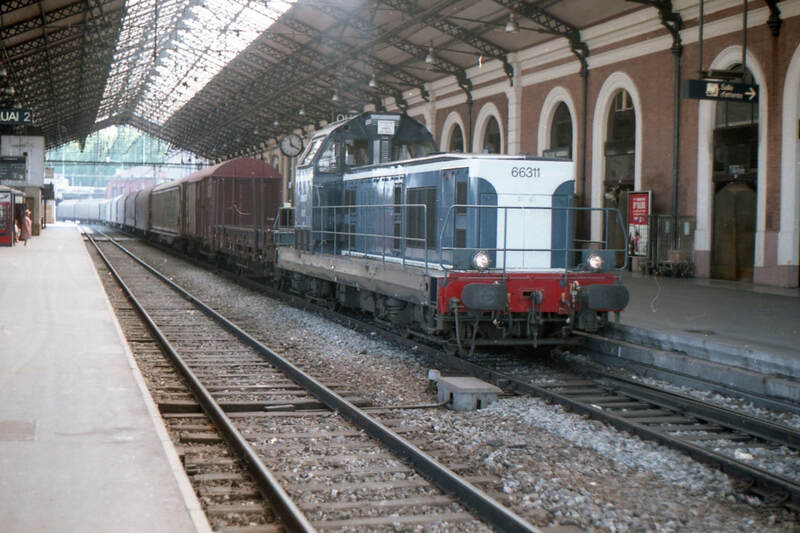 Serquigny is a junction with main Paris – Cherbourg line and appears to be a DMU stabling point. Mézidou (junction for Tours) has a large yard and loco stabling point. Caen (arrived on time) has loco depot just E of station. Station reminiscent of Derby, poor thing. ​0850 Caen - Tours GTMU (? - Turbotrain). On time departure, with aircraft imitations. 3 minutes late at Le Mans after a long stretch of cornflake country. Long queue at the reservation desk, so < 5 minutes before the 1046 TGV to Nantes and no reservation possible. 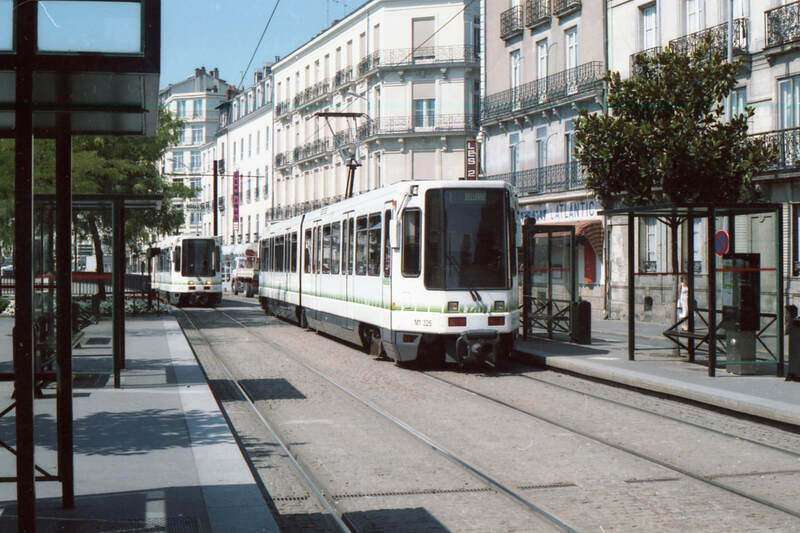 1103 Le Mans - Nantes. Air conditioned but still plastic seats. Le Mans station very pleasant, modern and with canvas awnings on the platforms. 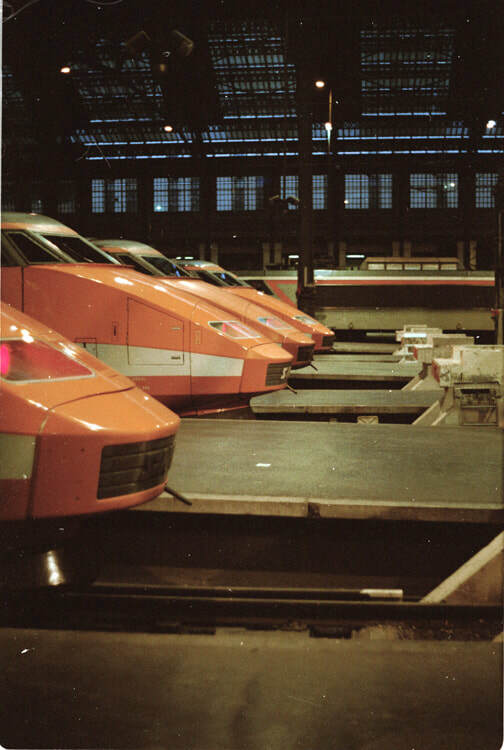 Motorail vehicles at the front of the train. Arrival at Nantes on time. More problems with TGV reservation so only a few minutes available for a quick photo of the trams outside Nantes station. 1336 Nantes - Paris Montparnasse TGV. The only seat available was a gangway one - lucky, as it was on the south (hot) side. Internal layout is very HST-ish including mismatch between seats and windows. 2 CGVs (chiens à grande vitesse) joined at Angers. Whole journey extremely rapid but so smooth it’s an anticlimax. Montparnasse station impressive - bare concrete and pipes everywhere in ‘high tech’ style. TGV on time, of course. After much debate about how to get to Austerlitz, went by Metro (60p). One line rubber tyred (very quiet), one conventional. Metro system very similar to London UndergrounD except lines numbered instead of named. Austerlitz seems down at heel compared with Montparnasse. ​1336 Nantes - Paris Montparnasse TGV. The only seat available was a gangway one - lucky, as it was on the south (hot) side. Internal layout is very HST-ish including mismatch between seats and windows. 2 CGVs (chiens à grande vitesse) joined at Angers. Whole journey extremely rapid but so smooth it’s an anticlimax. Montparnasse station impressive - bare concrete and pipes everywhere in ‘high tech’ style. TGV on time, of course. After much debate about how to get to Austerlitz, went by Metro (60p). One line rubber tyred (very quiet), one conventional. Metro system very similar to London UndergrounD except lines numbered instead of named. Austerlitz down at heel compared with Montparnasse. 2045 Austerlitz - Perpignan. No air conditioning, more’s the pity, and the inevitable plastic seats. Gruesome overnight journey via Les Aubrais, Limoges and Toulouse, getting colder as the night progressed. Missed Narbonne, presumably on the avoider as we stopped to change crew adjacent to the back of a loco shed. Arrived 3 min early at Perpignan after 9½ hours. Perpignan cold but the walls were hot! At Villefranche the standard gauge (overhead electric, on the right) ends and the narrow gauge (third rail electric, on the left) takes over. 0643 Perpignan - Villefranche. Modern EMU on a single track branch. Dead flat for 10 miles then suddenly into the Pyrenees, just before Vinça. You could put Punta Verde [an estate of pseudo Spanish style houses near my home] here and nobody would notice it. ​1040 La Tour de Carol - Toulouse. Another ‘mountain’ line, much of it single. Long tunnel under the Col de Puymorens followed a mile or two on by a spiral tunnel to drop the line down from nearly 4000 ft. Line follows a long and very deep gorge for many miles - very dramatic but difficult to photograph because of trees. ​2222 Bordeaux St Jean - Paris Austerlitz. Couchette and air conditioning! Woken by riotous SNCF behaviour (loco change?) at 0300-ish (Blois?) otherwise undisturbed until conductor arrived at 0550 on the way into Paris. Overcast with attempted rain on arrival (4 late - shock - horror). Near punctual arrival in fact enabled transfer of affections from 0740 Paris Lyon - Marseille to 0700 Paris Lyon - Marseille. 0700 Paris Lyon - Marseille St Charles TGV. Very unappealing orange/grey/white livery. Silver and blue Atlantiques are much smarter. Window seat facing, though! Travelled in the first of the two sets, splitting at Lyon with the rear set going to St Etienne. Vertical alignment of the TGV-only part of the route is very noticeable with steep gradients giving rapid acceleration and deceleration. Continued to Marseille on the ‘old’ route, which gets a bit seasick-making after 4 hours. Particularly repulsive ‘scenery’ between Arles and Marseille accompanied by strong chemical smells etc. Arrival at Marseille on time. 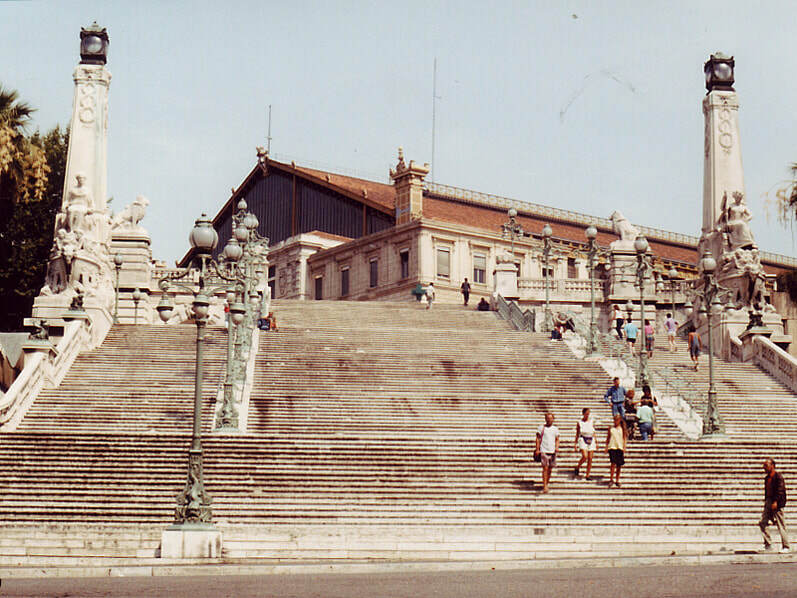 Magnificent marble staircase here leading up to the station. 1213 to Nice 5 mins late arriving but diversion provided by armed police meeting seven chained-together persons off a train from Bordeaux. Chained-together persons were made to carry large cardboard boxes containing Mystery Objects. 1213 Marseille St Charles - Nice. 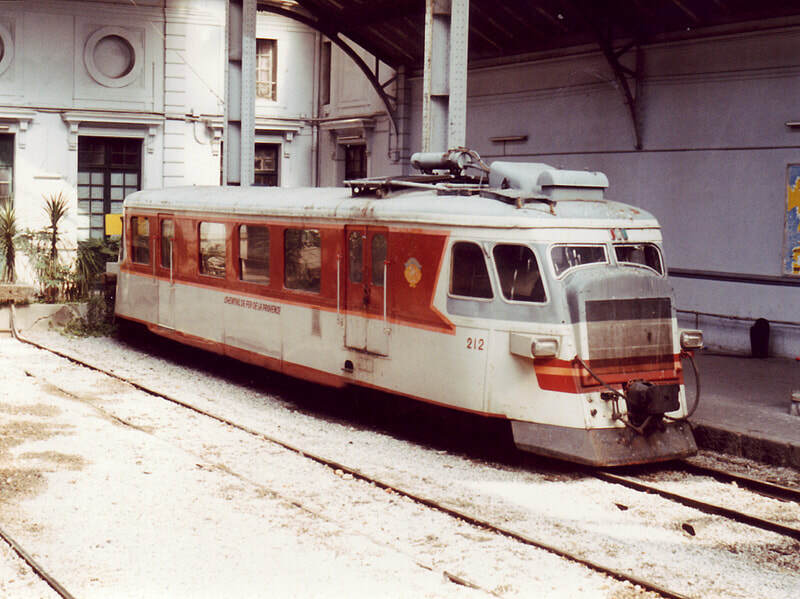 Corail air conditioned stock. Interesting view of the Riviera’s back yard. Dignity of the SNCF regained by on time arrival at Nice. 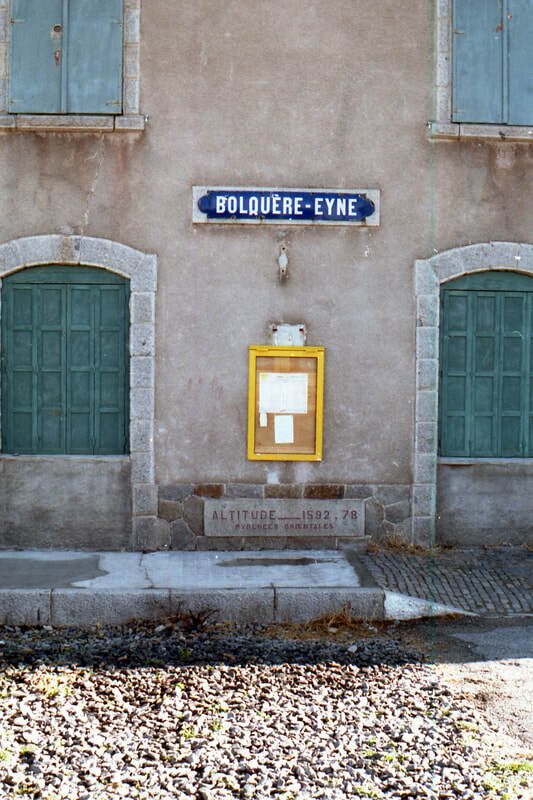 Chemin de Fer de Provence was like the IoM Steam Railway without the steam or the enthusiasm. 1953 Nice Ville - Paris Lyon. Air conditioning [in the top bunk of a couchette] struggling against the heat, a bit too successfully by about 3 a.m. Huge thunderstorm in the Rhone Valley ignored by SNCF. 5 minutes late into Gare de Lyon and no previous warning of arrival, therefore still fast asleep in bed! [I didn’t note it at the time, but I paid a lightning visit to Notre Dame and the Arc de Triomphe before heading to St Lazare]. 1052 Paris St Lazare - Dieppe Maritime. Corail air conditioning more successful this time . Very fast run to Rouen then change to diesel for Dieppe. Single line most of the way with at least one very severe gradient bringing the diesel down to 40 mph. Very English scenery (with French buildings and spotted cows) followed by much Frenchness and a punctual arrival at Dieppe. And a second trip on the Maritime branch; unfortunately it goes beyond the station. [Lucky I got to do it in daylight though, as it has subsequently closed]. 1345 Dieppe - Newhaven ferry. Left 15 minutes late for a rough crossing, but on time at Newhaven (1645). Through Customs and outside by 1648! 1705 Newhaven Harbour - Brighton. Usual scruffy 4-VEP but with cloth seats! Ride awful compared with any standard gauge in France, even the Metro. 1800 Brighton - Chichester. Must be run by SNCF; smart polite staff, and on time both ends. [Almost a prophetic comment as it turned out though of course I knew nothing of Connex then! So ended the first expedition, basically a mad dash to some interesting spots recommended by a friend, and fulfilling a specific requirement to get some TGV travel. A year (less a week) later, with the Eurobug starting to bite, I set off for Germany].